A man and a woman have moved into a small house in a small village. The woman is an "examiner," the man, her "claimant." The examiner is both doctor and guide, charged with teaching the claimant a series of simple functions: this is a chair, this is a fork, this is how you meet people. She makes notes in her journal about his progress: he is showing improvement yet his dreams are troubling. One day the examiner brings the claimant to a party, where he meets Hilda, a charismatic but volatile woman whose surprising assertions throw everything the claimant has learned into question. What is this village? Why is he here? And who is Hilda? A fascinating novel of love, illness, despair, and betrayal, A Cure for Suicide is the most captivating novel yet from one of our most audacious and original young writers. The information about A Cure for Suicide shown above was first featured in "The BookBrowse Review" - BookBrowse's online-magazine that keeps our members abreast of notable and high-profile books publishing in the coming weeks. In most cases, the reviews are necessarily limited to those that were available to us ahead of publication. If you are the publisher or author of this book and feel that the reviews shown do not properly reflect the range of media opinion now available, please send us a message with the mainstream media reviews that you would like to see added. “Time passed. After some number of days, one particular day arrived, and in the midst of that day, it was midday. The sun was shining so brightly overhead it seemed that every blade of grass could be made out, each from the others. It was a sort of harmony – nothing could be hidden, nothing at all beneath the sky”. A Cure For Suicide is the fifth novel by prize-winning American author, Jesse Ball. It begins with a nameless man (the claimant) who is living in a house in a village (Gentlest Village) where he is taught the basic activities of daily living by a doctor/guide (the examiner). The claimant is told he almost died, and is now being healed. The Process of Villages is the treatment he will undergo, the cure for suicide. Set somewhere far into the future, or in a parallel universe, Ball’s world, and certainly many of the character names, have a slightly Scandinavian feel to it (perhaps not surprising, given his Icelandic wife). If the reader can get past the first (somewhat bizarre) two thirds of the novel, then the discussion between the petitioner and the interlocutor forms an explanation of how the nameless man came to be going through the Process of Villages. While the lack of quotation marks for speech can be irritating, it is generally not a barrier to understanding who is speaking, except during the discussion with the interlocutor, when conversations reported at third or fourth remove create quite complicated sentences. Ball’s style is simple and stark, but his descriptive prose is, nonetheless, evocative: “She sat at a desk with her back to him, writing long into the night as she always did. The light from the fixture in that room was shabby. It fell very bitterly over the room, and some of the light from a lamp in the street contested with it. The effect was: as she sat at her desk she looked like a figure in a woodcut. And she sat as still” and “The manager, a yellowed, rancid sort of man, the type who seldom clip his nails, who believes they need be clipped less often than you and I do….”are two examples. Jesse Ball was born in New York in 1978. 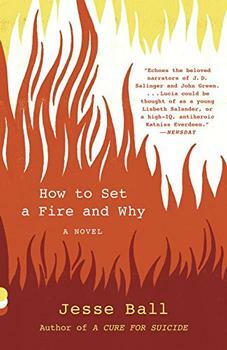 The author of fourteen books, most recently, the novel How To Set a Fire and Why. His works have been published to acclaim in many parts of the world and translated into more than a dozen languages. He is on the faculty at the School of the Art Institute of Chicago, won the 2008 Plimpton Prize, was longlisted for the National Book Award, and has been a fellow of the NEA, Creative Capital, and Guggenheim Foundation.